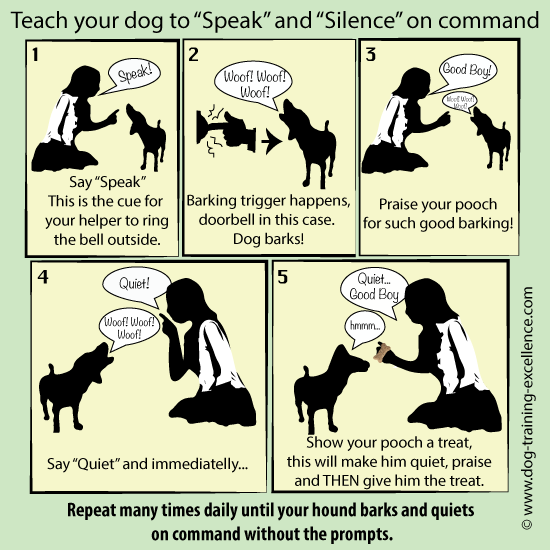 In this stop barking dog article I will show you how to teach your pooch the “Speak” command. When well trained and accompanied by the “quiet” command it becomes very easy to stop your dog from barking incessantly. 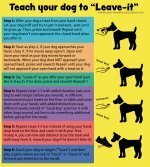 It is important to understand that you NEED to teach these commands to your pet to achieve results. You can’t expect your hound to stop yelping just because you are yelling NO! (actually, he might think you are barking with him!). Barking is one way in which dogs communicate, so it should never be punished. Your dog should also be allowed to bark in situations that he needs to. Barking becomes a problem when it is excessive. If your pooch barks in fear or stress, please read our main dog barking article for specific help. This stop barking dog step-by-step guide will teach you how to ask your dog to bark (great to make him burn some energy on command) and also how to get him to be quiet afterwards. Dogs learn in ways that are very similar to the way we learn. When a specific behavior is rewarded, animals tend to repeat that behavior (in order to get more rewards!). If, on the other hand, an action results in something bad happening (punishment or aversive), then your pet will likely avoid repeating that behavior in the future. Read about classical and operant conditioning to find out more about how dogs learn and how to apply it to training. 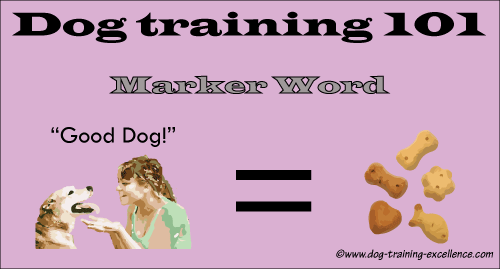 The first thing to teach any dog is a “marker” word. This is the word we are going to use to praise our pets, and it also needs to be trained. The good news is that it is REALLY easy to do. Simply choose your praise word (good boy! Great! Yes! Muy Bien! whatever you like). Now, say the word and immediately give your hound a treat. Repeat…repeat…repeat. Your pooch has learned the word when he starts getting excited at the sound of it (and before you take out the treat). With many repetitions, the word itself becomes a reward! Now you can use it to “mark” a good behavior, even when you don’t have treats or toys around. Stop barking dog by teaching your hound to speak and be quiet on command. You will notice that his barking will become more manageable and he will actually stop barking at your request. Choose the command word for barking: Speak, Bark, Woof, Talk, Loud, or any other word you want. Choose the command word for quiet: Quiet, Shush, Enough, Silence, or any other word you like. (You can also pick the commands in a different language, like Spanish or German). Have Yummy treats ready to be handed out, but keep them out of reach of your canine friend. A treat pouch, pocket or treat jar near by are all good options. Stop barking dog by identifying a barking trigger: does your dog bark at the doorbell? People walking by your house? The TV? Your singing? Whatever it is, you will need it in a controlled situation. For example, if your hound barks at the doorbell, you will need an accomplice to be standing at your door ready to ring the bell at your command. Stop barking dog by controlling his loud and silent times. 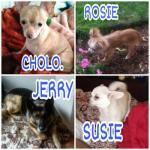 2- Bell rings and dog barks! 3- Praise your pooch! Use your marker word and some petting if your hound likes that. Do not use treats at this point, barking is usually fun on itself for dogs, so just praise is enough reward. 4- After a few nice barks say (loud and clear): “Quiet!” and immediately show (and only show) your pooch the treat and put it under his nose so he can smell it. This will stop his barking instantly! 5- As soon as he is quiet use your marker word for praise and then give him the treat. You are using the training method capturing for both commands. 6- Repeat this 10-20 times for a few days. When you notice that your mongrel starts being quiet faster after your command, start delaying the treat to extend the time he remains quiet. It's kind of like training "stay", but with shush instead. 7- Test time! Ask your bell ringer to count to 5 or 10 before ringing the bell after your cue. If your hound barks immediately after your command, but before the doorbell rings…he has learned to bark on cue! If he hasn’t just repeat a few more times the above steps. 8- To help your pooch generalize the concept of "barking" on cue, practice your commands without a barking trigger. Try alternating bark and quiet at different times of the day and in different places. Try it with a softer voice instead of loud. All these different settings will proof the command and make it more reliable. 9- Use your new commands to stop barking dog. 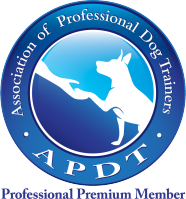 You can now train your dog when it is appropriate to bark and when to be quiet. Try it on a day-to-day basis as opportunities show up, but if there is a really strong barking trigger and your "quiet" cue doesn’t work, then set up a situation in which you can control the trigger and repeat it over and over until your hound succeeds. For example, if you furry friend likes to bark at cars on walks, ask a friend or relative to drive your car around the block constantly while you are training. Stand outside with your dog and before the car arrives practice Speak/Quiet. As you see the car approach in the distance ask your hound to quiet, use the treat in your hand to distract him if you need to. Praise and treat if he remained quiet or put the treat away if he barked. Your friend will drive by again, so repeat…eventually your hound will become accustomed to the car driving by and will successfully remain quiet. Praise and Treat! To stop a barking dog you should try it with different cars and very soon your hound will learn to be quiet at them. Remember to also teach your hound when it IS appropriate to bark, for example if a stranger is crossing your lawn. Practice this with friends too. 10- Speak is a great party trick too! You can even practice a little routine with your hound. Use a hand signal instead of a verbal command and then you can secretly tell him to bark or quiet while you follow your speech to entertain your friends. Practice makes perfect and dogs need a LOT of practice. Leave us your comments or questions regarding stop barking dog in the box below. If you would like to share your stories and pictures you can submit them here.